Future of Sourcing Digital is thrilled to bring you a new series titled “Women Global in Sourcing.” This series strives to highlight, celebrate and acknowledge women who are pioneers and leaders in the industry and who have been influential in moving the industry forward. 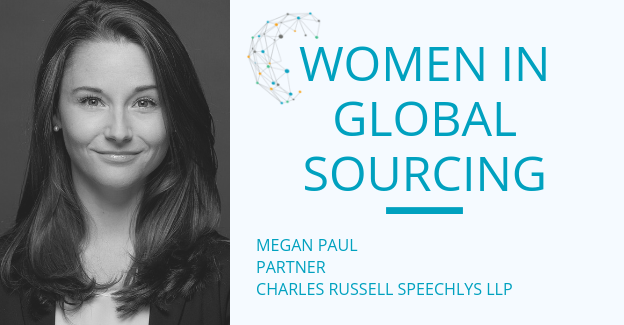 We are thrilled to higlight Megan Paul this week, a long-time contributor and supporter of Future of Sourcing. Megan is a partner in the Commercial team with Charles Russell Speechlys LLP in London. She has in-depth experience in technology, communications and large-scale complex outsourcing transactions, both locally and internationally. While I was training to become a lawyer with a firm in London, I worked with the outsourcing team. They were part of the broader commercial department but operated as technology and sourcing specialists. The team demonstrated pragmatism, legal excellence and a real passion for their careers. This was at a time when large traditional sourcing contracts were commonplace, often with terms of 10 to 15 years. I soon learned that my focus had to be on the client team and helping to build and maintain the customer/service provider relationship. I liked the sense of being constructive and future-proofing relationships, ensuring that they were flexible enough to move with the needs of the business, while creating a mutually beneficial dynamic for both parties. When issues arose, it was a test of creativity to find a practical solution suitable for both parties. Successful sourcing arrangements require a team of specialists – from the customer and service provider. It is important that they trust each other and cooperate to overcome obstacles, and anticipate how the relationship and each of the businesses will operate when working together. I relish the opportunity to work as part of such a team and enjoy the collaborative effort required in reaching a resolution at the contracting stage and then seeing how the relationship progresses over time. My role doesn’t stop at contract signature like many private practice lawyers. Our involvement may continue throughout implementation, at exit and when a customer is transitioning to another service provider. As a result, you work very closely with a client and really get to grips with the pressures, opportunities and challenges that the business and its stakeholders face. I would definitely follow the same path again. On qualification, I was given the opportunity to move to a larger, international law firm in London. I moved with the hope of working on bigger, more complex sourcing transactions with an international client base, and that is exactly what I’ve spent the majority of my career doing. I worked almost exclusively on sourcing matters for 10 years both in London and the U.S. (New York and Chicago). It’s an exciting sector to be involved with, particularly when considering the fast-paced trajectory that technology is taking the sourcing sector on right now. It is essential for my colleagues and me to understand the technological advancements affecting sourcing, and how such advancements impact specific sourcing arrangements and our clients more broadly across their sectors. It is this proliferation of ever-developing technologies that create the new technical, regulatory and legal challenges and opportunities that keep the sector moving and also provide a dynamic and exciting career. Leadership is different than management. But strong governance in sourcing contracts requires both. It can be relatively straightforward to manage a team to get the job done but the most successful sourcing relationships I’ve seen start and end with strong leaders, a supportive team and good governance. The best leaders I have seen in my career have been those who understand their team and know how to get the best from them in a positive way. That requires a genuine understanding of the people you work with, their strengths and how best to encourage them to fulfill their potential. The team needs to trust you and be on board with your decisions and the risks you may need to take to drive the business forward. In order to win that trust, a leader must be passionate and enthusiastic, have strong values, and be capable of conveying that passion and instilling the same values in the team. Everyone needs to be committed to the end goal and for that to happen a leader must delegate sufficiently for all team members to feel involved and accountable while feeling supported and encouraged. In the sourcing world, each contract negotiation, transformational project or exit depends on strong leadership and governance. Ultimately, if the relationships at the top are poor or the team is not committed to leadership and the governance structures in place, sourcing arrangements are unlikely to be successful. Who has been the most influential female figure in your professional life, and why? All the women in my professional life have made some impact on me and what kind of lawyer I am – whether that impact was negative or positive. When I first started my training, I worked with a woman named Margaret. She was head of technology at the firm and I thought she was fantastic. My time with Margaret and her team was the reason I became interested in sourcing and ultimately what then shaped my career choices moving forward. Once I qualified, I shared an office with a senior associate named Louise. Louise did not work in sourcing, but she was a technically gifted lawyer who was efficient, driven and brilliant. Sharing an office with Louise helped me develop my legal technical skills, attention to detail and made me understand that the “soft skills” were equally as important as interpreting the law. She taught me that you didn’t have to shout to be heard, but you did need to be prepared, ready to think outside the box for solutions and always (always) be client-focused. Achieving Partner at a law firm. It is something I always strived for and in the current climate in London it wasn’t easy. It has taken determination, hard work and a genuine love for my career and focus on my path. I’m enormously proud, even more so when one of my girlfriends realized that I was the first woman from our peer group to have achieved it (and yes, we could name a number of men who have). Many of my female law school alum have made a choice to move in-house or have chosen to leave the profession to become a parent. Having said that, we have a new senior associate who has come back to private practice having spent 10 years at an IT service provider as in-house counsel. Her expertise in technology, and sourcing in general, is truly impressive and between us we have a great balance and understanding for customer needs and legitimate service provider concerns. Being able to recognize talent and nurture it in a law firm is hugely important. Our business is our people and fortunately technology is helping to retain staff who want to make different choices while still have a fulfilling and successful career. How do you see technology changing the world of sourcing and your specific area of focus? There remains a continued focus on specific expertise – both human and robotic. Many service providers offer that focus by automating services using RPA, driving down costs and increasing productivity while up-skilling its retained human workforce. While there may still be a need for some human intervention in most current solutions, human involvement is minor – and will decrease as advancement continues. This has already had a massive impact on labor in low-cost service locations, and service providers that offer these locations no longer have a competitive advantage. This trend is likely to continue, but the human impact and what is done with these large, unutilized workforces as a reaction to the growth in technology will need to be addressed by the industry. We are still in the relatively early years of RPA adoption and widely used tools are relatively simplistic dealing with rule-based processes – and some customers struggle to quantify its value within their organization. However, service providers are beginning to understand and anticipate customer demand and the limitations of RPA by seeking to implement more judgment-based technology and end-to-end automated tools that integrate across the platform. It is becoming more sophisticated and there is likely to be a demand on service providers to identify the value for the customers – in its broadest sense. The next stage after adoption of RPA will continue to revolutionize the industry, and the costs and legal implications of the robotic learning and associated liability will be cause for debate amongst legal teams. The majority of younger women starting their careers are likely to have a very different experience to what I had. The pace of technology means that the next generation of careers will take a very different trajectory with the environment becoming much more competitive. Specialisms are important but having a range of skills suitable for the industry will be necessary to be able to adapt and understand the pace, scope and nature of this dynamic industry. I would want our next generation of young women to understand technology, how to create it, how to monetize it, how it impacts business and how to use it to lead from the front. Take on as much as you can and fill your CV with as many different skills as possible, and always have confidence in yourself and in your will to succeed. Megan is a partner in the Commercial team with Charles Russell Speechlys LLP in London. She has in-depth experience in technology, communications and large-scale complex outsourcing transactions, both locally and internationally. Megan also advises on the commercial aspects of private equity and M&A transactions. Megan was previously at Mayer Brown International LLP where she spent ten years, with secondments to Nomura International plc, Unilever plc and Airbus SAS as well as an international secondment to Mayer Brown's head office in Chicago working for the firm's US client base. Megan is admitted to practice in England and Wales.